30 Dec 2012: Sunny day, so a good one to be out and doing things. 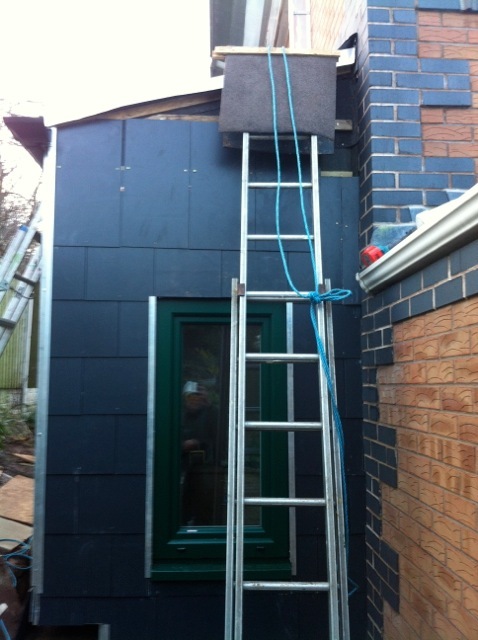 I had my grown up children and their partners staying for three days, so could not do much in the morning, but in the afternoon, I got some courses of slate up, and nearly finished, as darkness fell. This wall has been left to last because it is the one that has a gutter going across the wall, and the down pipe will discharge into the white gutter on the right. After dark, I made an aluminium bracket that will hold the discharge hopper - will be fastened to the brick wall. Slating has been slow because the surface areas are small, and so many slates are custom-cut to fit all those edges and openings! The corner quoins are 3D, in out in out, and each edge slate requires additional toothed outline along the left hand edge. 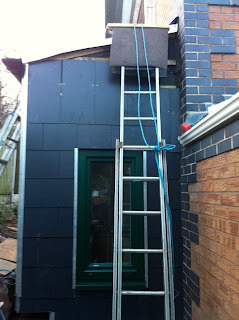 The carpet tiles are an ideal way to prevent the ladder ends from scratching the surface of the slates.